The Pearly Razorfish or Xyrichtys novacula is a beautiful species of Razorfish that grows to about 10" (25cm) in length and is found at depths of up to 100 feet (30 meters). These saltwater fish can live up to 8 years old and are found in subtropical regions in the Eastern Atlantic Ocean as well as the Gulf of Mexico. 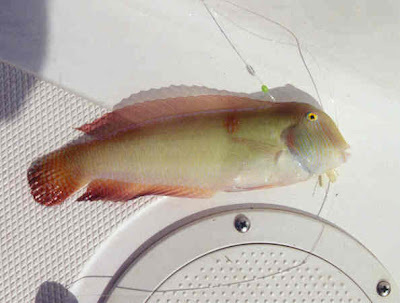 Pearly Razorfish have a snout that is very blunt along with a pale body with red highlights on its elongated fins. Its head it probably the most interested part of this saltwater fish, it has a gorgeous pattern of vertical lines made of light blue, yellow and orange coloration. If you have any additional information about the Pearly Razorfish please leave us a comment below.